I am a Linux Geek. What finally brought me to this realization? Well, it all started last night. You see I was looking for a new display manager to use on my netbook, GDM has been getting bloated and I was looking for something a bit more trim. I came across SLiM in my various searches, but after giving it a try I decided it was not for me. It was late, so after uninstalling SLiM I went off to bed leaving my display manager search for another day. As I was running out the door this morning I quickly shutdown my netbook down and threw it into my backpack, playing with display managers was one of the last things on my mind - it was a busy day! When I got to lunch I pulled out my netbook to check my email quickly only to discover the system was hanging at the Pinguy E17 boot splash. This was odd, I hadn't had my system randomly deiced to stop booting since I started using Linux. First things first, I did a cold shut off and waited for it to power back up again - after five minutes at the boot splash (that I normally see for 10 seconds, fast SSD) I concluded the system was not about to boot up. So I started thinking "What did I change to cause this?" - and that is when it hit me. The system wasn't "randomly freezing" I had caused it to start freezing! After I uninstalled SLiM - I never set GDM to be the default display manager again. Not a problem, the flash drive I keep on my key chain is boot-able. I loaded the live environment, mounted my internal drive, and then ran dpkg-reconfigure gdm in a chroot environment and set GDM to be the display manager again. I restarted the system and this time around I saw my boot splash for a few seconds as normal and my system was starting up as it should. I am a Linux Geek - and I am proud of it! Have you ever come to this same realization about yourself? If so, what caused it? I'm just wondering why you went to sleep instead of continuing the search. The real solution would have been to gulp some mountain dew and keep looking. I realized I was a linux geek when I was actually excited that windows stopped running on my laptop because it forced me to get more acquainted with linux for everyday use. "Have you ever come to this same realization about yourself? If so, what caused it?" In 1995 I bought a copy of RedHat and locked myself in a room learning the OS as a requirement for my company to win a bid for a project. Soon after, Windows 98 was released and after using it for a few hours (I worked for an OEM / consulting firm at the time) I realized that I hated it. I shifted my computers over to RedHat and didn't look back (with a few small exceptions) until a few months ago when I compared Windows to it, and then switched over to Windows full time at home. Realized it a couple of months ago after tinkering and modifying various bits of code here and there, adding/removing packages just to TRY and get a minimal as possible system up and running, on a computer that absolutely have no need to run it. I'm in love with being completly in control of my own computers and ruling my processlist as a tyranny. This article is deicedly horrible and poorly written. TTY? Sure - Every time I travel a mile to assist some one in need of an expert to restore their broken Linux system. I'm maintaining about 10 installations of the Ubuntu distro in various versions for friends and family, and I'm loving it. I switched to ALL Linux back in 2006 when I got fed up with WinXP's constantly breaking down and always having to call some MS dwarf on "hotline" to reactivate the new install. For some four years I haven't been forced to reinstall my Linux box, only to reboot it whenever a kernel update forced it. Many thousands read each month and I've only gotten a handful of comments such as yours... So I am going to assume you are a minority. As a regular Slackware user, you tend to forget what you run, because you set it up and forget it. That I was getting into heavier geekery became clear when the Xfce battery monitor became too CPU intensive and I did a script calculating the remaining battery by cat'ing present capacity and dividing it by full capacity and multiplying by 100 - and then showing this figure with a % after it on the toolbar. "I may not look like what we often type cast as a Unix Geek"
Jeff, I'm sorry (I think) to say this but after looking at your picture I'd have to disagree with that comment. When I started building distros. The first time I programmed with Basic in '83 I knew I was geek in my bones. But I kept getting laid and living rock-star days. Then in '97 my closet geek would no longer be contained. I bought 4 grand worth of system and accessories from Gateway and today I am posting this message telepathically by way of my tel-dec-post system I mounted on a ladybug. How dare you assume I am a minority. Why bring race into this? Linux doesn't judge based on color or creed. Why would you? Also, if you have so many thousands of readers each month, wouldn't you want to give them the basic consideration and respect to take the time to proofread your posts? Oh linuxn00b. The word minority in the context in which I used it has nothing to do with race... But then I think you knew that. Go troll on another blog you didn't enjoy reading. How dare you assume that the word "minority" only refers to race? In this case, it refers to you being in the minority of readers who dislike Jeff's writing, while the majority of us do. If you don't like what you read, go troll somewhere else. A lot of you are far more elite than I, but my realization came about just recently. As of September of this year I have been using GNU/Linux as my main OS for a solid year. When it clicked that I had been a GNU/Linux user, exclusively, for over a year I began counting myself as "a Linux geek." I still have a long way to go toward mastering this OS, but if nothing else, I have started down that path and I don't see myself diverging anytime soon. During the day I work with Windows, but after work I come home and I get to play with Linux, and for the first time in a long, long time using computers is fun again. But seriously, I came to the realization in 2000 when I first started dual booting Red Hat, then SuSE, with WinNT4. After repeatedly screwing up my school laptop and having to re-image it almost every week, then reinstalling linux, I was hooked. Then came the Gentoo phase. Fun times. And remember, Linux doesn't discriminate! Heh you got your first troll Jeff (at least that I've noticed)! I blew down Fedora 14 on my thinkpad yesterday, it's pretty slick. You should give'er a review. Well I'm perfectly content with my Linux box since I switched full time over to Linux a few years ago. 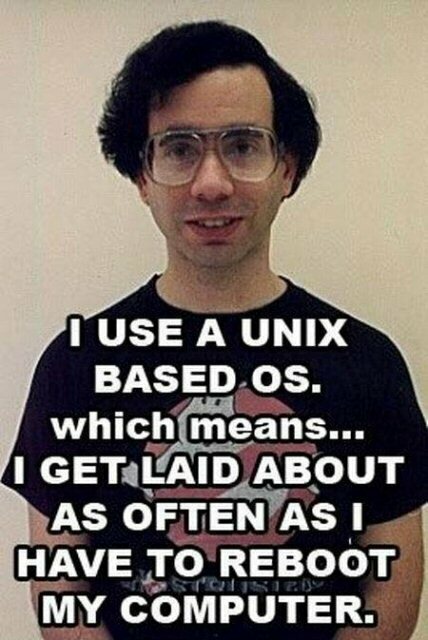 I use Ubuntu myself but Unix-based OS is cool by me. I discovered Linux a couple of years ago. Soon after I was distro hoping like crazy. I had various partitions and was all the time installing new distros on them. One day I unplugged one of two disks inside my rig, to facilitate the management of the boot loader. After trying w7, I decided it was not worth enough to steal any room from my distros, so I don't plan to install it. Today, I still have that unplugged disk inside my box. It's the one I used for many, many years, with windows on it. When I remember that I never ever had the need to plug it back again, I realize that I'm a Unix Geek. Jeff -- Did I miss a post somewhere about your travails with SLiM? Curious to find out what didn't work well. It works perfectly fine for me on Slackware -current on both X86 and X86_64 laptops. And changing the bg pic is as simple as editing the path-to-pic on a single line. No fuss, no muss. Obviously YMMV. Slim just didn't look as nice as GDm I felt. Also, does it support auto login? Well over a decade ago, I was told that I was too stupid to make Linux work, so I was better off to stick with Windows (which I could not work). I agree, I'm slow-witted, but necessity drives me on. I consider myself an eternal novice, not a geek ("newbie" is a bit insulting, IMHO). I'm a Redmond refugee. BTW, I'd be very interested in your opinion of my favorite distro, Arch Linux. I've tried/used the original SuSE, the old RH, Slackware, Debian and a few others (even messed with FreeBSD for a while), and Arch is my choice. Finally: Jeff, don't feed the mutants. Just wipe up the troll tracks and move on. I have been dual booting Ubuntu/windows 7 (previously ubuntu/vista) a while. Just the other day I determined I would much rather put the effort into getting all of my games to work in Ubuntu,rather than use windows, so I deleted the hard drive and fresh. It also pleases me that i'm actually working to get games working, as opposed to just installing it and everything works fantastically. This is by far more fun. 1995. Win95 - going to fix it all. Really cool. Using a Dell will be fun. It was for a few weeks. Awesome. Color screens. the Net was just getting raucous and pre-commercial. then I asked Win95 to do some things. .. . Trip to the mall: SuSE version 4? from that point on it has been GNU/Linux and/or FreeBSD. And oh so many hours reading on-line or texts! I guess the geekiness of me is expressed in the fact that I have some 40 boxes in my basement; at one time they were all running FreeBSD 6.3 and I was very happy. And now they are running freeNAS, Centos, debian, Ubuntu/Mint, OSX, XP, W2K ... hmnn, i really ought to run Win98 on one. And they are all scavenged. And, over the years of Eiffel, erlang, Ruby, Perl, etc. ... I have settled on Python ... and C. (Java is a question mark now, as is MySQL). When I was talking to someone about what I liked to do with my computer and he said "man it sounds like you intensionally bork your system just so you'll have an excuse to fix it". I had to agree he was right.